It’s officially now that Volkswagen Group Malaysia introduces the new choice for driving pleasure, the Tiguan 1.4 2WD, a fully imported compact SUV from Germany which is available for viewing at all Volkswagen dealerships in Peninsular Malaysia started last Friday. “The Tiguan is the latest addition to our range of offerings and it is a dynamic two-wheel drive SUV that provides power yet fuel efficiency for the performance-driven, and still encapsulates advanced safety features for peace of mind. It provides both a fun and dynamic city drive as well as comfortable long-distance travelling experience making it a more accessible addition to the trademark ‘Tiguan’ experience,” said Christoph Aringer, Managing Director of Volkswagen Group Malaysia. The Tiguan features a 1.4l (160PS) twin-charged direct petrol injection TSI engine mated to a 6-speed direct shift gearbox (DSG) for a riveting performance. This winning combination produces a maximum torque of 240Nm kicking in from a low 1500rpm, enabling it to accelerate from 0 to 100kph in 8.9 seconds with a top speed of 198 km/h. With a stellar combination of its innovative TSI and DSG technology, the Tiguan delivers maximum power with minimum fuel consumption. For driving enthusiasts, rest assured that its direct shift, dual-clutch transmission offers the smoothest shifting to further enhance the experience behind the wheel. On the fuel efficiency front, the Tiguan has impressive combined fuel consumption ratings, returning an impressive 7.1litres/100km (works out to be 14.1km/litre). The only SUV in its segment to offer these exclusive innovative features, the two-wheel drive Tiguan is equipped with an automatic stop/start system engine that prevents unnecessary engine idle to reduce fuel consumption and CO2 emissions. Additionally, it is equipped with a regenerative braking system where kinetic energy applied during drive and brake converts to recharge the vehicle’s battery. Passenger protection is a high priority at Volkswagen. Offering the advanced ‘Rest Assist’ drowsiness detection system that alerts the driver when he or she is drowsy, the Tiguan features Electronic Stability Control (ESC) designed to prevent under-steer or over-steer during bends. In its interior, the car is further equipped with 6 airbags (dual front, dual side and curtain), standard three-point seatbelts, safety-optimised front headrests which is particularly effective at helping to minimize head and whiplash injuries in an accident, and an anti-theft alarm system for unparalleled safety and security. The interior of the Tiguan remains true to its promise of comfort, with space and innovative features in abundance. Fitted with ‘Milan’ Alcantara seats, the Tiguan comes with a built-in electric parking brake with auto-hold, leather gear knob, auto dimming rear view mirror, foot lights, split folding rear bench with slide function, folding table on front seats, adjustable front centre armrest, seat adjustments for the front seats and variable seating system and 8 speakers. Amplifying the experience for customers further, the optional Tech Pack features even more innovations, such as a ‘Rear Assist’ rear view camera, ‘Climatronic’ auto air-conditioning with 2-zone temperature control system, RCD510 colour touchscreen with MP3 and 6-CD changer radio system, multiple connectivity options such as Bluetooth, cruise control and a leather steering wheel. Possessing its signature style, the Tiguan is unmistakably a Volkswagen. With chrome radiator grille framed by swept back headlights, the practical SUV comes equipped with bi-xenon headlights for low and high beam with integrated LED daytime running lights (tech pack), dynamic headlight range adjustment and dynamic bending lights (tech pack), front and rear fog lights, and electric adjustable folding and heated exterior mirrors (tech pack). Though elegant, its ruggedness and aggressive styling is accentuated by four 17-inch ‘Boston’ alloy wheels and silver anodized roof rails. Further equipped with environment lighting, heat insulating glass, rain sensor and rear parking sensor; a wider and lower stance also gives the Tiguan a sharper profile. 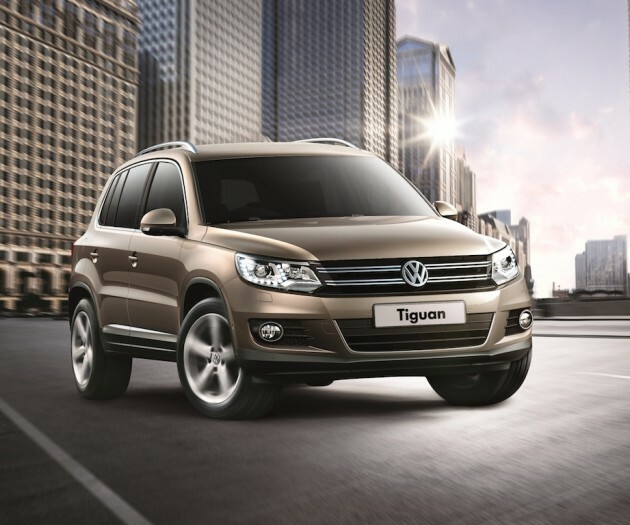 The Tiguan is offered in five colour choices: Pure White, Reflex Silver, Titanium Beige, Pepper Grey and Toffee Brown. The Tiguan is price at RM178,888 and an option for Tech Pack at RM188,888.